Indie studio Stainless Games says gamers looking forward to the new Carmageddon title have none other than Square Enix to thank for it. It's been a long time coming, but a new Carmageddon release from the studio that originally created the series is finally in the works. What took so long? Stainless Games co-founder and CEO Patrick Buckland said his studio has been angling for another racing game for chemically imbalanced for the past six or seven years but nobody seemed interested. "When [SCI] bought Eidos we were hoping to get more Carmageddon licensed work," Buckland told Gamasutra. "We made them offers and tried to buy the license off them, but there was no way that Eidos or SCI were ever going to sell that license." But then Square Enix entered the picture, purchasing Eidos [and its parent company SCI] in 2009, and suddenly things changed. "Square... had very valuable IP that they had purchased that they were never going to use, and they took the surprising decision they were willing to sell this IP," Buckland continued. "Most companies would probably just sit on the IP; why sell it? We paid real money for it, though." He also expressed confidence that the franchise still carries some weight with gamers in spite of the fact that it's been more than a decade since the last game, the poorly-received Carmageddon TDR 2000, which wasn't developed by Stainless. "There are very few games out there that can really make people laugh their heads off," he said. "It's not a substitute for gameplay - you won't get away with just a sense of humor - but by having a sense of humor that's what makes it stand out, and what gives it a special place in a lot of people's hearts. People remember Carmageddon in a way they don't seem to remember a lot of others games." 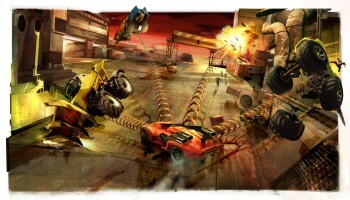 Carmageddon: Reincarnation is currently slated for digital release sometime in 2012.